I often get asked about adding pasta to slow cooker recipes. Can you add raw pasta to your dish, or cooked pasta? Firstly the fast option is to add cooked or almost cooked pasta at the end of your recipes cooking time. Like any pasta you wouldn’t want to overcook it, so if it’s been pre-cooked then only leave it in there long enough to heat through with the rest of the recipe. Or cook pasta separately and serve with your slow cooker dish at plating time instead. But what if you want to add raw pasta to your recipe? When you add raw pasta to your recipe you need to have enough liquid to accommodate that. While cooking, the raw pasta will draw up a lot of liquid from your recipe. As you can see it has much less free liquid after pasta is added. This is a great way to thicken your dish if that’s what you want but it can spell disaster if your dish is already fairly dry. As a general rule add raw pasta about 45mins prior to serving. 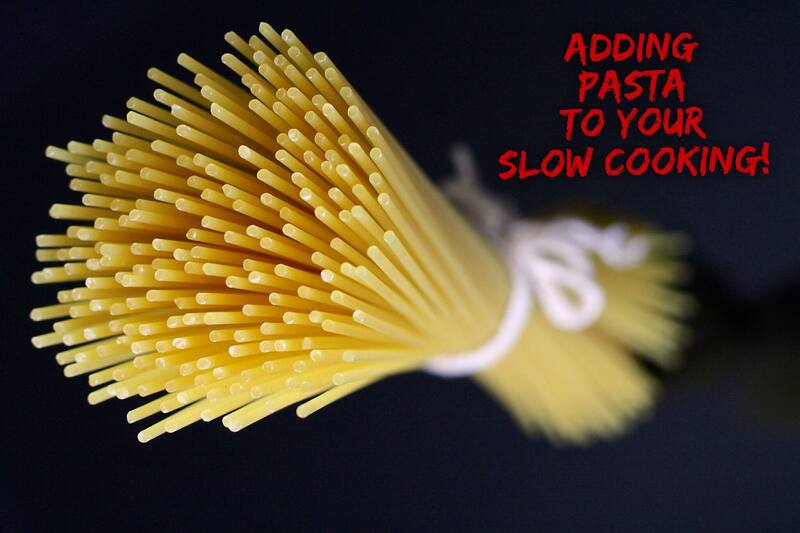 Hope this helps with your next slow cooker recipe you add pasta to! And don’t forget … for actual PASTA RECIPES we have heaps and heaps of tasty and complete slow cooked pasta meals and recipes HERE! Please don’t use delay timers in slow cooking! Thanks for this Pauline. I have tried a couple of times adding raw pasta with not so wonderful results, usually ended up just adding cooked pasta towards the end. Thanks so much for this information I always worried about over cooking my dishes that need pasta so I usually cook it separately. Am anxious to try this!